My good friend, and very good comic, Kelly Mcdonald calls it an ‘idiot check’; a last-minute turnaround to look at where you had been sitting in an airport, or restaurant, or wherever, to see if you’ve left something. A good idea, but horribly mislabeled. It’s a rather smart thing to do, and I found myself doing an ‘idiot check’ early Saturday morning at Portland’s airport as I began a week-long cruise on Holland America’s Rotterdam. If I had discovered something forgotten, my feeling thankful for remembering to check would have eclipsed any feeling of being an idiot. The only idiotic thing to do, besides forgetting something, is to not check. The real ‘idiot check’ is long after you’ve left something behind, after you’ve put some un-retrievable time and distance between you and your forgotten item; that’s when you look in the mirror to check for idiots. This trip I’ve already left behind some great Thanksgiving Day memories. My eldest daughter had been away to college for a couple months and this was her first return home. It was a special few days, this Thanksgiving school break, where all of us were together, and atypically, there were no huge fights. It’s still an adjustment; when your first child moves out, and you reset the default of who you are living with; two kids instead of three. You think you know, and have adjusted, but her return from college made me realized what had been missing; a bright, beautiful young woman who completes my family. She brought home her dirty laundry too, gotta take advantage of that free washer and dryer. She is a college student after all. Early today, Sunday November 27, I was met in the lobby of my hotel in San Jose, Costa Rica by my driver and several others who were bound to join the ship. There were six of us, and our driver, for the three-hour trip to the Atlantic port of Puerto Limon. I’ve made the drive many times and had a horrible experience once heading the other way when our van broke down in the rain forest and during a torrential downpour. The three hour drive turned into six. This trip was pleasant and the company good. The drive spoke excellent English and chose to stop at a very friendly restaurant named, the Me Gustas Tu Cafe -which translates to the ‘I like you’ cafe. It had a couple open fires going that were partially covered with steel plates on which kettles of coffee; sweetened, or black, or with cream, sat warming and ready to be scooped up and poured from. Costa Rica has good coffee and to grab it hot from atop an open fire; well, that just adds to the flavor. 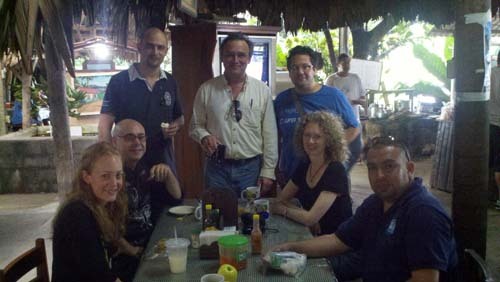 Here ‘s a photo of the seven of us inside (it was an open-air restaurant, as so many are along the drive from the capital to the coast) while we took a break from the drive. If you look close, over in the background on the right, you can see the kettles of coffee. That’s a mug of the stuff in my hand. In the photo are, from left to right, a gal flautist who was joining her boyfriend for eight days (and she wasn’t sure how smooth the sailing was going to be! ), the bald guy with the glasses is a guest entertainer (along with the other gal, and the guy in the blue shirt standing next to me), the other standing gentleman was a photo technician who intended to be on the ship for only thirty minutes to repair something then catch a ride right back. And lastly, our driver. It was really a pleasant stop, but I just now realize, as I compose this on the ship after leaving Puerto Limon, and we sail towards the Panama Canal, I didn’t look back to see if I forgot anything when we left the cafe. What an idiot.